your plans for next Saturday April 13th just got better, all you have to do is get yourself to Aventura Mall, into Macy's and onto the second floor to come and mingle with Miami Style Mafia's Simonett, Ginger of Electric Blogarella and myself. The Miami Style Mafia along with Miami Metropolitan International Fashion Week will be hosting this VIP fashion event that will include a runway show and personal styling consultations by the three of us, as well as makeup tutorials by Macy's premier makeup line, Impulse Beauty. You will also get to sip on some cool cocktails, good bites and and fun tunes to make you shake it just a bit. Spring just got better, so come on out and let's meet, chat and show you what this Spring's style is all about, you won't want to miss your chance to have fun and learn a few tips all at the same time. 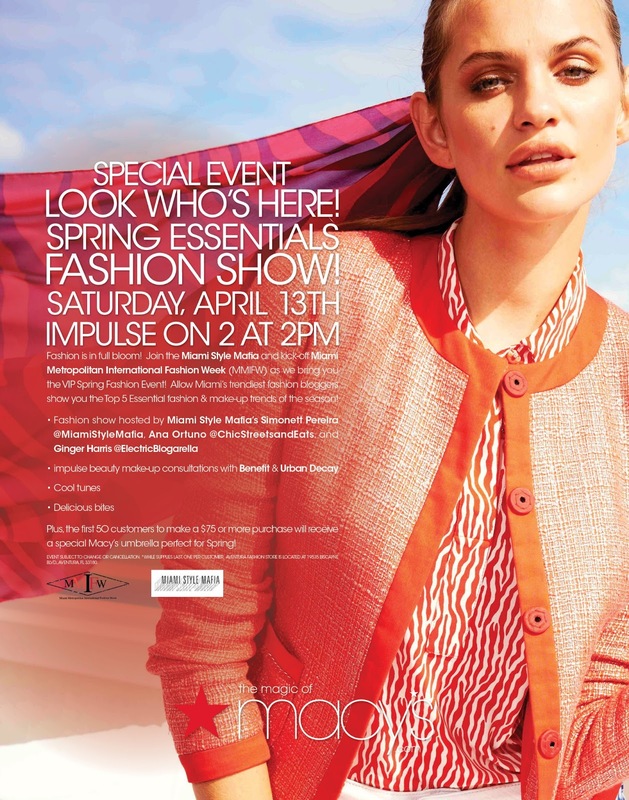 Look forward in seeing you there, space is limited so make sure you RSVP to rsvpmacys@mmifw.com.